Candy Boards And Frostbite. Ah, January In Maine. Since the bees had such a hard time storing honey this summer and given the collapse of last year’s supper strong hive in February I think it is safe to say that I am dubious about these new hives making it to spring. We had to start feeding with sugar syrup during the fall and a few months ago switched to candy boards for the hives. Candy boards can be made with or without cooking the sugar. The no-cook version takes more time to prepare since the water has to evaporate. It will take an 8 frame hive over a day to cure and a few days for a 10 frame hive. My local bee gurus recommend a no-cook recipe of 1 pound of sugar to 1oz. of water, per frame. So, for our 8 frame hives we would slowly add 8 lbs of sugar into 8 oz. of water. Then we would pour it into our candy 1-1 1/4” board frame and wait a couple days for it to dry. The whole point of candy boards or fondant feeders is that they lack the water the sugar syrups contain. I opted for the cooked option because I am impatient and love any excuse to play with molten sugar. 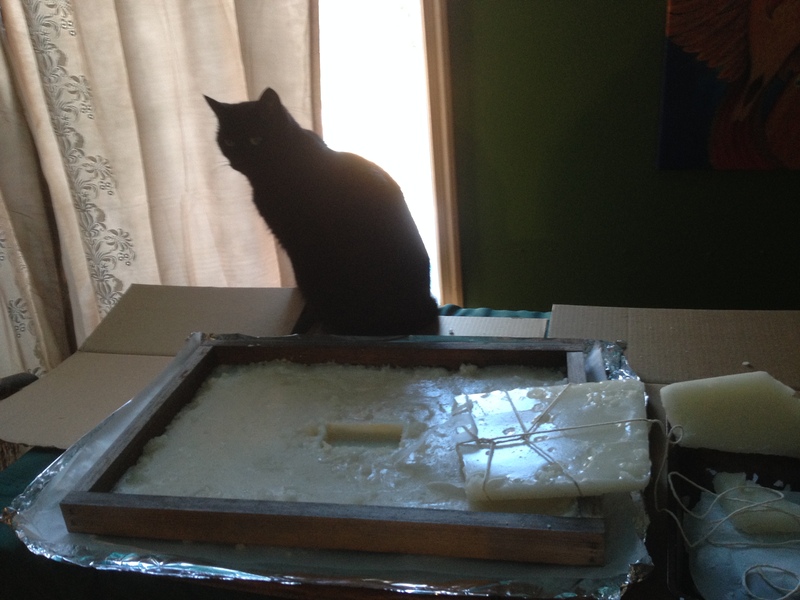 Luna was less than impressed with my use of her table but she is unappeasable this time of year with the outside white and frozen. The cooked recipe I choose requires heating 1 pint of water and 5 lbs granulated sugar to 240˚ degrees F. There are many other recipes out there but I only needed a small batch. For either method make sure to put a block where the inner cover opening is so they can get in, out and around the sugar iceberg. When using the cook method; make sure to keep stirring the mixture so that none of it caramelizes and only heat it to just before the hard ball stage. Caramelized sugar is toxic to bees. No one seems to know why. Excess carbon? Molten sugar can cause severely painful burns to everyone else so be VERY CAREFUL if you elect the cooked option. I have been welding since I was 12 and cooking in professional kitchens since I was 15; my burn experience is extensive and let me assure you- sugar burns are the worst! After the mixture approaches that magical number (240˚F) you can turn off the burner. As with all cooking- there will be a period of carry-over cooking where your solution will continue to climb a few more degrees. Letting it cool to 180˚-200˚F before pouring it into your wooden frame. I like to set the frame on parchment and then wrap the whole thing with heavy duty tinfoil so you don’t have a molten sugar flood. We also did some smaller molds for the smaller hive. You can use pie tins, bread pans, cupcake molds, just make sure not to make them too tall. Now came the hard part. Ripping the roof off of a very cold, pissed-off bee colony… Twice. It was as I expected and I was very glad for my snow gear underneath my bee gear. Normally, I have no problem opening the hive in a tee shirt but during the winter it’s a different story. Cold and hungry they are in no mood for my shenanigans. When the hive is testy the rest of the year; maybe two or three guard bees with zip at you with that unmistakable “you will DIE!!! !” direct flight for the offending appendage. When a hive is truly irked the difference is terrifying. Even just 20 kamikaze bees flying directly at your face is more that enough for me and so there are no pictures of me installing the candy boards. Since I was under-siege at the time. I even got stung for the first time this year. After I got back to the house by a soldier that hid in-between my glove and sleeve. Presumably so it could follow me back to my lair and take me out. As if the wintertime temperament of the bees was not bad enough- we have had a few nights cold enough so some of the ‘large combed’ chickens developed minor frostbite. I went into the Guinea/chicken coop and saw droops of bright red blood around the feeder. 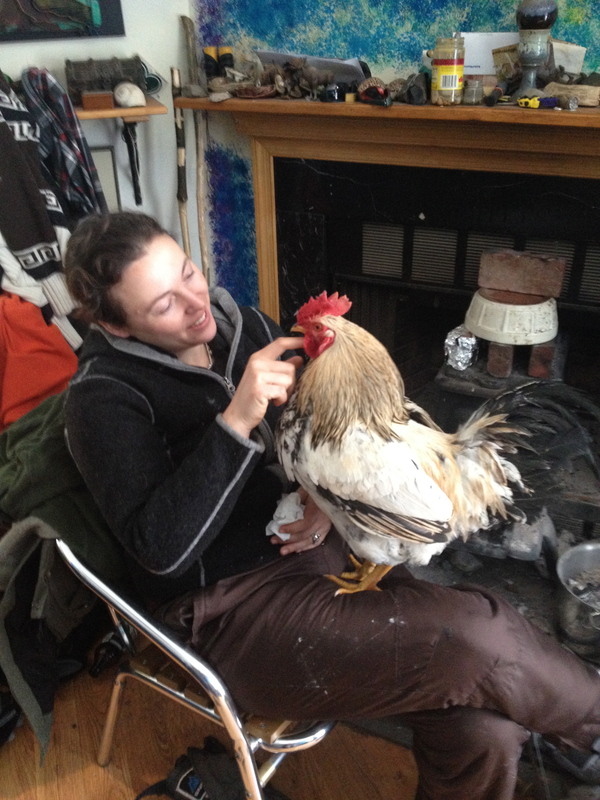 It didn’t take long to figure out that it was my Little Rooster Man who was bleeding. I got worried that the Guineas had stated to beat up on him. Apparently, they have a tendency to gang up and take-out cocky roosters. I haven’t seen any aggression on either side (as of yet) but it gave me flashbacks of last winter and my four rooster debacle. I was relieved after I brought him in and cleaned him up- that it was just the tip of a comb that was bleeding. After an extensive clean up and slathering with cornstarch topped with some chicken salve, he was good as new. I decided instead of sending him back out only to refreeze; we would sit by the fire and dry out. 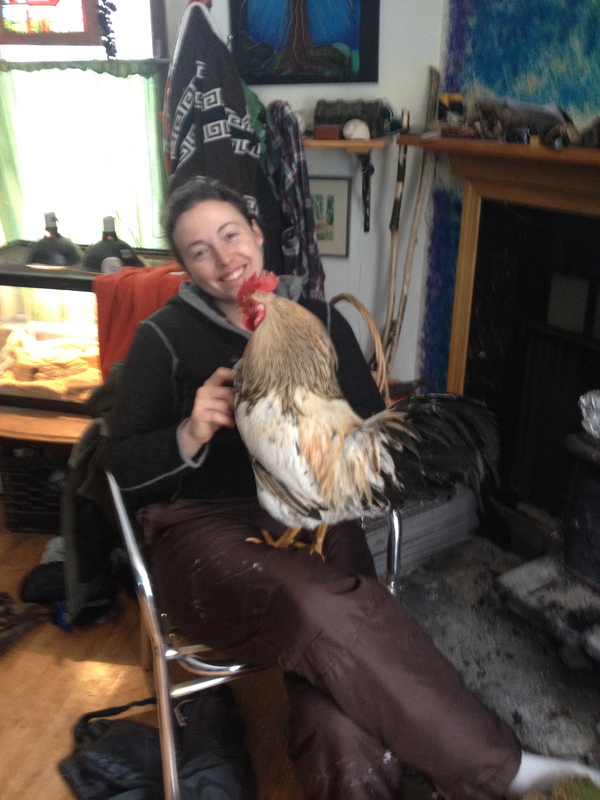 He didn’t seem to mind and I was totally amazed at how calm and behaved a chicken can be, even with me poking at him ceaselessly. Then again he was born in the house. Who am I kidding, I was having a blast. I could blame it on winter but that would be a lie. That is amazing how calm your rooster fella is. But even the baby hawk was easy to handle. 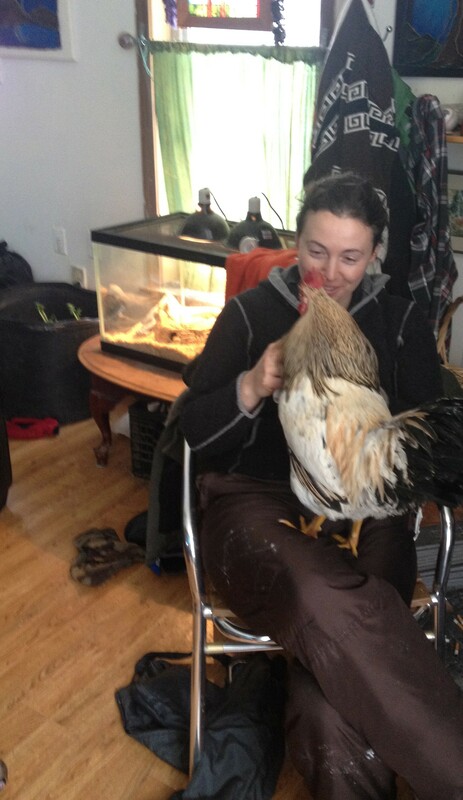 Now, if only the husky could be as well behaved as the chickens we would be in business! Some people just have a way with animals and I bet they are smart enough to sense your caring. Kindness is the universal language. With animals you can’t tell them “i’m going to help you” (though I always talk with them when I am working.) They feel your intentions and as long as I am kind and considerate I rarely have problems… Except with the bees, sometimes they are just pissed at me, even when I am trying to bring them huge blocks of food. Be well, thanks for reading!